crowd-pleaser. The second is that it's a great alternative to and a fun twist on typical BBQ chicken. 1. Preheat an outdoor grill to medium heat and lightly oil the grate. 2. 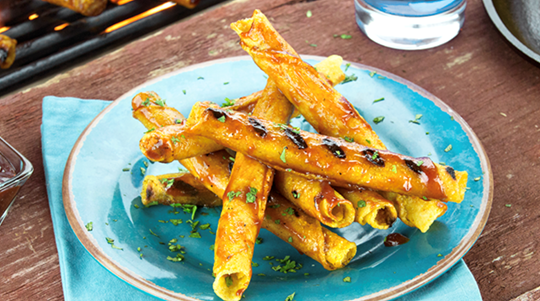 In a large baking dish, coat the Chicken Taquitos with 1 cup of the BBQ sauce. 3. Add the Chicken Taquitos to the grill and cook for 6 to 8 minutes, rolling them along the grates until cooked on all sides and warmed through, brushing them with the remaining BBQ sauce.